Locally common in mixed and coniferous forests of King and Kitsap Counties. Rare in Island County with just two Whidbey Island records. Fairly common locally in moist conifer forests of western Kittitas County, rarely into drier forests farther east. 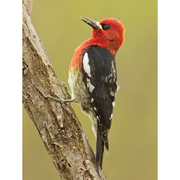 Sometimes pairs with Red-naped Sapsucker, particularly along crest on Kittitas side; hybrids observed with some regularity. Requires suitably large tree in relatively intact forest for nesting, hence mostly extirpated as breeder from developed urban and suburban areas.